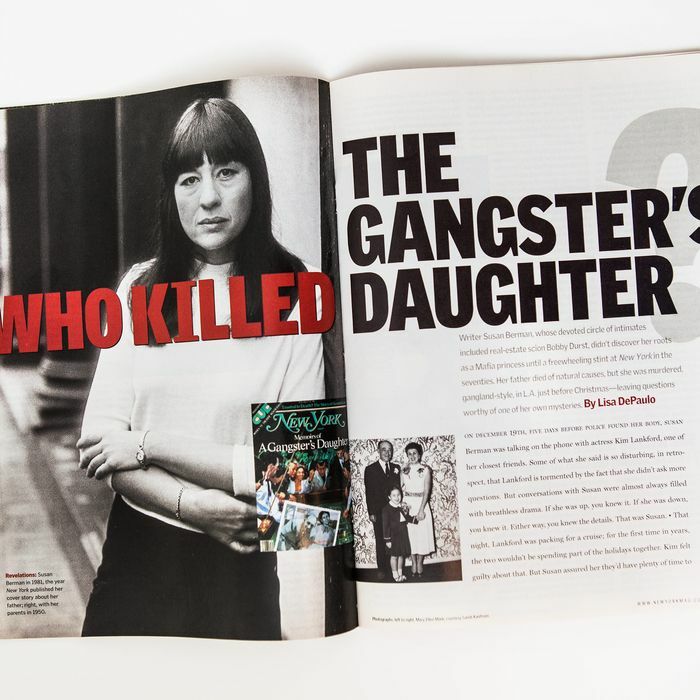 Lisa DePaulo’s 2001 feature on the murder of writer Susan Berman in New York; March 16, 2001. Photo: Left to Right, Mary Ellen Mark; Courtesy of Sareb Kaufman. This piece originally ran in December 2001. We are rerunning it in advance of HBO’s The Jinx, a six-episode documentary series that examines a number of unsolved crimes in which Robert Durst was a key suspect, including the 2000 murder of Susan Berman. Berman was a New York magazine writer in the ’70s and ’80s, and the following feature chronicles the mystery surrounding her death. Writer Susan Berman, whose devoted circle of intimates included real-estate scion Bobby Durst, didn’t discover her roots as a Mafia princess until a freewheeling stint at New York in the ’70s. Her father died of natural causes, but she was murdered, gangland-style, in L.A. just before Christmas — leaving questions worthy of one of her own mysteries. On December 19, five days before police found her body, Susan Berman was talking on the phone with actress Kim Lankford, one of her closest friends. Some of what she said is so disturbing, in retrospect, that Lankford is tormented by the fact that she didn’t ask more questions. But conversations with Susan were almost always filled with breathless drama. If she was up, you knew it. If she was down, you knew it. Either way, you knew the details. That was Susan. Susan promised they would talk more after the holidays. It wasn’t unusual for her to be “about to get information”; she was a journalist. And she was working on three big projects — two book ideas and a television pilot. Two had to do with Las Vegas, where Susan had spent her childhood as a mobster’s daughter, a subject that haunted all of her work, as well as her life. So Kim assumed it was something about that. When she hung up, Kim thought to herself, Who cares who killed Bugsy Siegel? At another point in the conversation, Susan said she’d just talked to a psychic. This, too, wasn’t unusual. Psychics were among the few things Susan had faith in. She had regular phone consultations for over 15 years with her psychic in New York, but it seemed she had seen a new one recently in L.A. “She told me I was going to die a violent death and that there’d be a gun involved,” Susan said. Less than a week later, at 1 p.m. on Christmas Eve, the Los Angeles police were called to Susan’s rundown home on Benedict Canyon Road by neighbors who’d grown alarmed that one of her three wire-haired fox terriers — so precious to her, such a nuisance to others — was running wild and barking hysterically. Susan would never have left Lulu unattended for so long. The cops found the front door unlocked and the back door ajar, and followed the bloody pawprints of the dogs to the back bedroom. Dressed in sweats and a T-shirt, Susan was lying on the cold hardwood floor, with a single bullet in the back of her head. She’d been dead for at least a day. It’s been over two months now, and the mystery of who killed Susan Berman has only gotten creepier and more complex — the kind of story Susan herself would have been obsessed with. When news of the killing hit the papers in early January, it shocked the literary communities on both coasts. From her impressive career at New York in the late ’70s and early ’80s to her subsequent years in Hollywood, Susan made a vivid impression wherever she went. Few, particularly in creative circles, could resist the mob daughter turned journalist with a repertoire of fantastic, almost unbelievable life stories. She also had a catalogue of bizarre fears and phobias, impossible for anyone close to her to ignore: She couldn’t cross bridges or drive on certain streets, she couldn’t eat in a restaurant without interrogating the waiters or summoning the chef (panicked that she would die from one of her countless allergies), and she couldn’t go above the third floor in a building unless accompanied by “a big strong man” and assured that the windows were “hermetically sealed” (her biggest phobia was that she would hurl herself out a window). 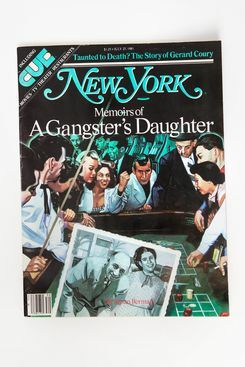 Susan Berman’s New York cover story on discovering that her father was a gangster later in life; July 22, 1981. And given what she’d been through in her 55 years, they also understood them. Susan had survived the Las Vegas mob of the ’50s, and one unbearable loss after another. She had almost come through the brutal downward spiral that led her from a life of enormous (mob) wealth and success as a writer to such financial and emotional despair that she resorted to selling her mother’s treasured jewelry. Through it all, she was always Susan — complicated, tormented, irresistibly entertaining. The case took a more macabre twist when Westchester County District Attorney Jeanine Pirro announced that Berman had been on her short list of witnesses to interview in yet another eerie case, a coast away from Susan’s struggles. Nineteen years ago, Kathie Durst, the estranged wife of real-estate heir Bobby Durst — whose family’s Durst Organization owns more than $650 million worth of Manhattan real estate — had vanished in New York without a trace. For nearly two decades — as the pretty medical student’s friends spoke out about an abusive marriage and battles over money — investigators had their sights on the now-reclusive Bobby, who happened to have been extremely close to Susan Berman, going back to their days at UCLA in the late ’60s. Susan referred to Durst, who declined New York’s request for an interview, as her brother; the dedications in her books invariably began with his name. “It was always ‘Bobby this, Bobby that, wonderful Bobby,’” a friend recalls. Yet when Susan tried to reach him last summer to borrow money, she was irked to find he’d changed his phone number. So she wrote to him in care of the Durst Organization. The letter reached its target: In the months before her death, she had cashed two $25,000 checks from Bobby. In fact, Susan borrowed a lot of money from a lot of people over the years and always tried to pay it back. In this case, however, she was touched, one friend says, that Bobby had told her the $50,000 was a gift. This past November, as a result of a lead in a separate case, the long-dormant Durst case was reopened by Pirro’s office — to a flurry of national headlines. Meanwhile, New York investigators, acting on several tips that Berman might have some critical information, sought to find her. They got there too late. Suddenly, the “Durst connection” — Was she killed because she’d been harboring some secret about Bobby? Was he sending her cash out of kindness, or to buy her silence? — piqued the interest of the national media. By early February in Los Angeles, you couldn’t visit Susan’s Benedict Canyon home without encountering a photographer in the bushes. Susan’s daily routine included marathon phone conversations with people she was close to — and that was a fairly large group. “If you were a friend, you were a close friend,” as one put it. She insisted you be well-versed in the characters and plots of her colorful and troubled journey, especially that of her beloved father, Davie Berman, the Las Vegas mobster who was Bugsy Siegel’s partner and who died at 53 of a heart attack when she was 12. She would write that she never appreciated the irony that he was maybe the only gangster of that era to die a natural death. More ironic was that she would be the one to die, 43 years later, with a bullet in her head: If it wasn’t a mob hit, it sure looked like one. Her father was the “love of her life.” His FBI wanted poster was hung prominently in her living room (the phrase on it, ALIAS: DAVE THE JEW, amused her to no end), and most of her friends knew the story of his funeral, when little Susie tried to throw herself into the casket. Then came Uncle Chickie, the debonair gambler who raised her after her father’s death and who, like Susan, died broke. And of course, there was Mister Margulies — that was his real name — her only husband, who died of a heroin overdose. And they knew all about her glamorous mother, Gladys, the onetime tap-dancer who lived in perpetual fear that her family would be killed and who had been institutionalized for depression much of her short life. When she died, at age 39 — Susan was 13 — the death certificate said “suicide by overdose.” But Susan, an only child, always believed her mother was killed by the mob for the sizable fortune Davie Berman left her. Nearly 20 years ago, when she wrote her acclaimed memoir, Easy Street, for which she diligently researched her father’s past, she’d also tried to solve the mystery of her mother’s death. Now she’d been talking about investigating that mystery again. Could that have been the big news she was about to get her hands on? There are scars within me that will probably never heal; I have uncontrollable anxiety attacks that occur without warning, I am never secure and live with a dread that apocalyptic events could happen at any moment. … Death and love seem linked forever in my fantasies, and the Kaddish will ring always in my ears. Susan was 32 — and already a successful journalist — before she began to believe her father really was a gangster. She’d begun her career in the ’70s at the San Francisco Examiner, creating quite a splash with a magazine cover story headlined, “Why I Can’t Get Laid in San Francisco.” Despite her obvious intelligence (not to mention her career as a reporter), she’d managed to hold onto her innocent memories of Davie Berman — the man who took over Bugsy Siegel’s “operations” at the Vegas casinos in 1947 when Siegel was gunned down gangland-style (and Susan was 2). That changed after one too many New York colleagues asked if she was related to the notorious gangster. In 1977, she became obsessed with finding out everything — traveling back to Vegas and her father’s hometown of Ashley, North Dakota, using the Freedom of Information Act to get crateloads of FBI files about her daddy. It was all there: the bank robberies, the kidnappings, the killings, and those unknown years before she was born, when he’d spent seven years at Sing Sing. Easy Street was published to raves in 1981 and bought by Universal Studios for $350,000 (the movie was never made, a long-standing source of disappointment to Susan). During that time, she wrote for New York — though never in the office, of course; it was too high up — penning clever and sassy articles on everyone from Bess Myerson to herself (she wrote at length about her phobias, which didn’t kick in until she was 27 but flourished in Manhattan). Susan was, as Silverman puts it, “a lot of work.” She was famous for fallings-out with people that could last for years. “If you pissed her off,” says her adopted son, Sareb Kaufman, “she was like, ‘Fine, you’re out of the Rolodex. You obviously have an issue.’” But she also took no small pleasure in directing the lives of everyone in her circle. Bede Roberts, who’d known her since her Berkeley days, remembers telling Susan she fancied a man on campus who’d jilted her. “’You really want this guy, you’re sure?’ Susan asked. ‘Okay, I’ll get him for you. But you’ve got to do everything I say, nothing more, nothing less.’ Susan plotted the course of his breakdown with exquisite precision.” And he married her. In no time, he’d moved into her Benedict Canyon home — the same one she would return to years later and die in. In those days, it was a lovely, cheerful place; Dee Baskin Schiffer kept it up then, according to Susan’s friends. “And there was love in the house,” says Kim. “They were crazy about each other.” In June 1984, in a lavish wedding at the Hotel Bel-Air complete with ice swans (like the ones Davie the Jew insisted on having at the Flamingo), she married her Mister. Bobby Durst gave her away. Film producer Robert Evans toasted the couple. Susan footed the bill. Soon after, she bought a beautiful home in Brentwood. The marriage lasted little more than six or seven months. “She called me crying and said, ‘It’s over,’” says Julie Smith. “I said, ‘What, Susan?’ She said, ‘He’s been doing drugs again and he’s been abusing me.’” Susan knew when she married him that Mister had done heroin in the past, but she believed it was over. Susan was naïve to the point of being puritanical about drugs, say her friends. Despite the pain in her life, she never self-medicated. “I don’t think she ever smoked a joint in her life,” says Lankford. “The only alcohol she ever drank was a glass of wine at Passover.” This too came from her father, who told her that drugs and alcohol “were for suckers” and not something Jews did. Her relationship with Paul ended in 1992 — around the time Susan went broke. The bank took her house and she had to declare bankruptcy. Friends say the couple came undone by a project they tried to do together — a Broadway musical based on the Dreyfus affair. To finance it, they used Susan’s assets. The musical never got off the ground. The relationship failed. Susan had another breakdown. The person who would have been notified first was Sareb, who lived nearby and talked to her daily. But he was traveling in Amsterdam; it seemed as if everyone was away. When Susan didn’t call him on Christmas Eve — a night they always spent together — and didn’t return his calls, he feared something horrible had happened. “Even if she was laid up in the hospital,” Sareb said, “she would have called me.” In the last year, she and Mella had become estranged. It bothered Susan terribly, and she worried endlessly about Mella. At the same time, she had rewritten her will and cut her out. Not that there was much left, besides mementos and the rights to her work — though they may well have grown in value since her death. She left the rights to at least one of her works to Nyle Brenner. This was the night that several people had what they later described as unsettling conversations with Nyle Brenner. “At least I won’t have someone calling me three times a day,” he said to one attendee. “She sucked me dry,” he told another. But there has also been much discussion among her friends about what Susan really knew about Bobby and Kathie Durst. One told New York that many years ago, Susan revealed that “she’d provided Bobby’s alibi” — while insisting it did not mean she thought he was guilty. The cops have the hard drive to her precious computer, and sources say it is rich with clues. Her Rolodex — reputed to contain over 1,000 numbers — is also being pored over by investigators. New York has learned that the police have also obtained Nyle Brenner’s files. No gun has been found. But a bullet casing found at the scene — and reported to have been from a small-caliber gun — gives investigators a shred of hope. It is widely theorized that whoever killed her was someone Susan knew — or a professional hired by someone Susan knew —whom she trusted enough to let into her home, or who knew enough about her to get into her home. Susan, with all her fears and neuroses, would never have let a stranger in.